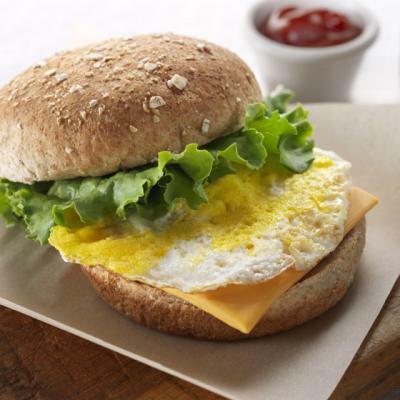 Whisked eggs that are baked in a pan, cut into pieces and tucked into whole wheat dinner rolls or buns make simple, tasty egg burgers. If you’ve got them, add cheese, lettuce or sliced tomatoes to complete the burger look and taste. Preheat oven to 350°F (180°C). Line a baking pan with parchment paper so paper extends slightly beyond both long ends of pan. In a large bowl, combine eggs and pepper. Whisk mixture or beat with mixer just until blended. Pour into prepared pan. Bake until cooked through and set, about 20 minutes. Remove from oven and cut into 20 (3 x 2.5-inch/8 x 6 cm) pieces. 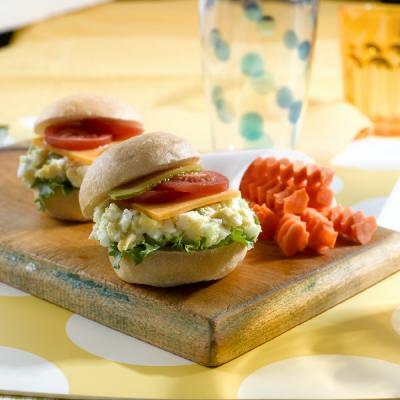 Cut rolls in half; place a piece of egg on lower half of each roll. Cover with top halves. Serve with ketchup, if desired. 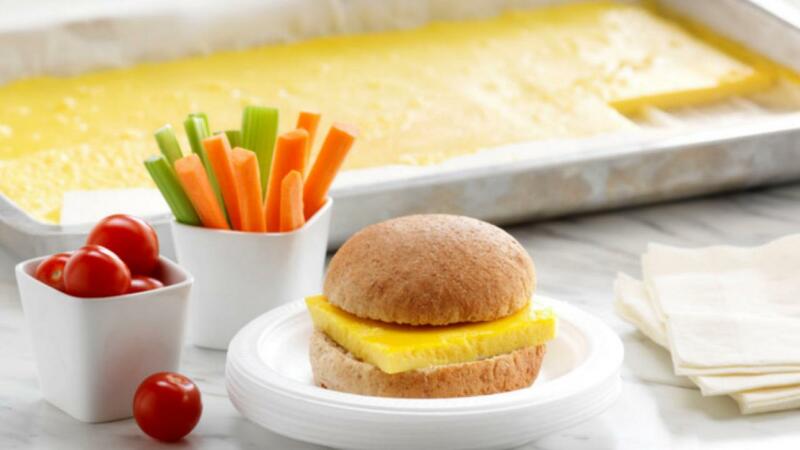 The baking pan should have a 1-inch (2.5 cm) edge (or higher) to avoid spilling eggs when the pan is placed in the oven. Parchment paper isn’t essential, but using it will make the eggs easier to remove from the pan, and clean up will be faster. Instead of parchment paper, the pan can be sprayed with cooking spray. Leftovers can be wrapped well in serving portions and stored in the fridge for a couple of days or frozen for a month. Cheese: After removing baked eggs from the oven, sprinkle grated cheese over top or cover eggs with slices of Cheddar or Swiss cheese. Let cheese melt briefly before cutting eggs into pieces. Herb: Add 1 to 2 tsp (5 to 10 mL) Italian seasoning to eggs before whisking. Fried: If you don’t have an oven, but do have a griddle, crack eggs onto the hot surface, break the yolks and cook until the eggs are set, flipping over to briefly cook the other side. Tuck into a bun and add a squirt of ketchup. Egg Wraps: Cut baked eggs into strips to fill whole wheat tortillas along with sliced sweet peppers, shredded lettuce, grated cheese and salsa.